Try these pretty winter decorating ideas for transiting after the holidays to add global wintery decor to your home all season long. Happy New Year friend! I took a lovely two week vacation from blogging to spend time with my family. We traveled to Osaka, Japan and explored Kyoto, Nara, and Kobe with some friends while we were there. I’m also officially a year older since I’ve talked to you last! (Did I ever tell you my twin and I are Christmas babies?) How was your holiday? Are you making any New Year’s resolutions? Well The Global Styler series continuing for another year and I’m so glad! I just love creating globally influenced decorating ideas and decor along side my talented friends every month. 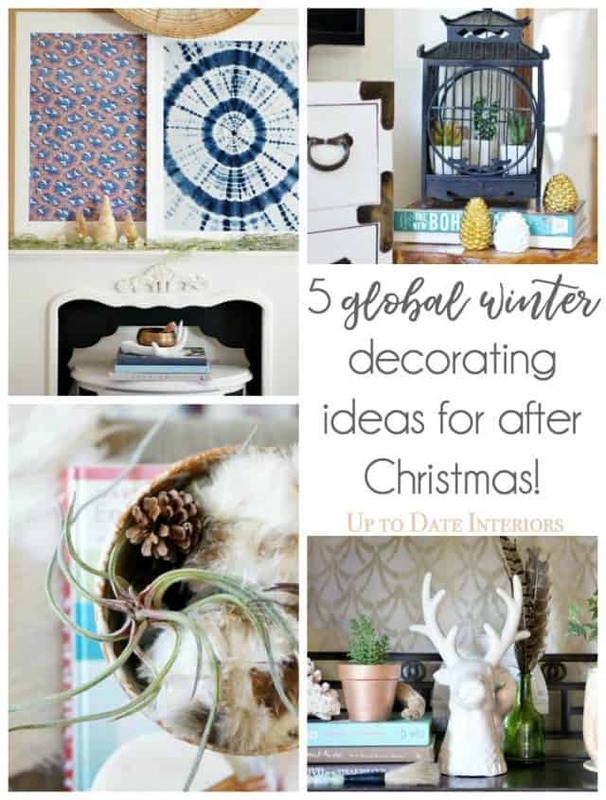 Casa Watkins Living, A Designer at Home, and I are sharing some fabulous global winter decorating ideas to transition from Christmas to winter. Check out the easy decorating tips below! Before you put away all your Christmas and holiday decor this year, consider using these decorating ideas throughout winter! Leave out furs, winter pillows, and global textiles. Use them in unexpected places! Sheepskins are wonderful just about anywhere! Place them on the back of a chair, sofa, or over a table or ottoman. You could also drape them over a stair banister or hang it straight on the wall. Get crazy and layer fur on fur! Don’t put away all your Christmas lights. Keep white lights or fairly lights out for a soft glow on your mantel, in your house plants, or in a pretty container. What I miss the most about Christmas decor is the tree lit up so having a few fairy lights through winter is wonderful for late nights and dark mornings. If you have any Christmas ornaments with wintery hues like fur, wood, or mercury glass, display them in a pretty bowl. Don’t be afraid to add a faux air-plant or succulent to the mix! A couple of our large fur ball ornaments sit in a wonderfully textured ceramic Japanese bowl (thrifted!). Have fun with winter vignettes. Keep out your bottle brush trees and other woodsy flora. On our recent trip to Kyoto we picked up some darling ceramic houses in a cute little shop near the Philosophers path (if you are familiar with the city). I mixed them with some old bottle brush trees to create a small village on our mantel. Perfect with twinkle lights and faux moss garland! I also left out our metallic pinecones from our global Christmas decor. It’s nice to have our bookshelf back in order but it’s fun to leave out a few Christmas decor like a white deer head, antlers, and other animals. Do you have any favorite Christmas decorations that stay out through the season? Would you try any of these ideas? If you are ready for a 30 day decorating and organization challenge, check out Love Your Space ebook! Need help with the decorating process? Sign up for a FREE 5 day email decorating course! Don’t forget to check out my friends’ tips for transitioning from Christmas to winter decorating. Beautiful winter decor. I love the bowl full of plants. You always have the best vignettes. Wonderful ideas and such a beautiful decor and pictures! I loove the pillows they look amazing. Aw! Thanks so much Jenny!